Country singer-songwriter Eric Paslay recently released his debut self-titled album on 4th February. Eric has written a lot of hugely successful tracks, including Jake Owen's hit Barefoot Blue Jean Night and Love & Theft's Angel Eyes and he has co-written all eleven tracks on this debut release. The first single, Never Really Wanted was released in 2011. The acoustic and electric guitars blend nicely together and create a nice backdrop for Eric's vocals. The drums are evident but not overpowering and set up a strong pace that keeps the track moving well. The album's second single is a track that I am sure many country fans will recognise. Friday Night was originally included in Lady Antebellum's 2011 release Own The Night. 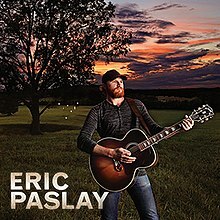 Written by Eric alongside Rose Falcon and Rob Crosby, Eric's release is similar to that of Lady Antebellum but more grounded in a country music sound, with banjos and fiddles evident and holds less of the pop sound that comes through on Lady Antebellum's version. Newest single Song About A Girl feels a little overly rocky at points. It also doesn't hold my attention as much as the other tracks on the album do and feels a little like a throwaway addition to the album (which has some far better songs on it!) I also found Like A Song to be a little overpowering at points. You can feel the energy in the track however I found myself wanting to reign the instrumentalisation in at various times. Country Side Of Heaven is in my opinion one of the best tracks on the album. The track features backing vocals from Little Big Town who, as a group well known for their brilliant harmonies, accompany Eric really well. The production throughout the track is very good, with the instrumentalisation fading and growing throughout. Lyrics such as "an angel plays a southern hymn on a silver mandolin" and "where the fish are always biting, you don't even need a hook" sets up a lovely imagery that rounds out the song well. Little Big Town's Kimberly Schlapman was the first to hear the song and I thought the sentiment in this quote from Eric was worth sharing. "We just stood there with our hands in our pockets just looking at the speaker playing, but it was cool" he said. "I know that she has lost really close people in her life and I think that's what music is for. It's one of the best medicines, even if you're completely broken-hearted, it somehow can get you through your tough stuff. I know that's definitely true to my life, how music can help you overcome things. I think "Country Side Of Heaven" is one of those special songs. I am glad that it moved Kimberly and it moves me". I would also definitely recommend listening to She Don't Love You. With just an acoustic guitar as accompaniment for the opening vocals, the listener is immediately drawn to the song in the obvious contrast between the rest of the album. Eric delivers a very heartfelt performance throughout and lyrics such as "she don't love you, she's just lonely" and "so forgive her if she's distant, she can't tell her heart to lie" draw the listener in to the emotive story behind the song. As a songwriter of some great hits already you can expect Eric Paslay's album to be full of lyrically strong songs and he doesn't disappoint. The production is also impressive throughout, the musicians are strong and the majority of the album is produced at a perfect level for each track and the differences keep it interesting. Recommended tracks are Friday Night, Country Side Of Heaven, Good With Wine and She Don't Love You. Eric is currently touring with Brantley Gilbert and Thomas Rhett across the US but I hope we will eventually get to see him play some dates over here, the album holds a strong mix of songs that I am sure will be great to hear live! Having come across this cover I felt I needed to share it so please have a listen! Labels: Eric Paslay "Eric Paslay"